The Twenty-first Ohio fought bravely in some of the Civil War's bloodiest battles, including Stones River, Chickamauga, and the Atlanta Campaign (Resaca, Pickett's Mill, Kennesaw, Atlanta, and Jonesboro). It was the first Union regiment to enter Savannah on Christmas Day 1864 and continued on to Bentonville during Sherman's campaign through the Carolinas. 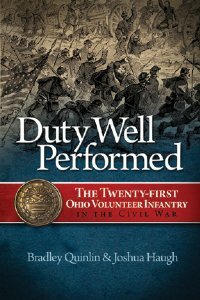 Before heading home to Findlay and other small towns in northwest Ohio, the Twenty-first completed their military commitment in Washington as part of the Grand Review.